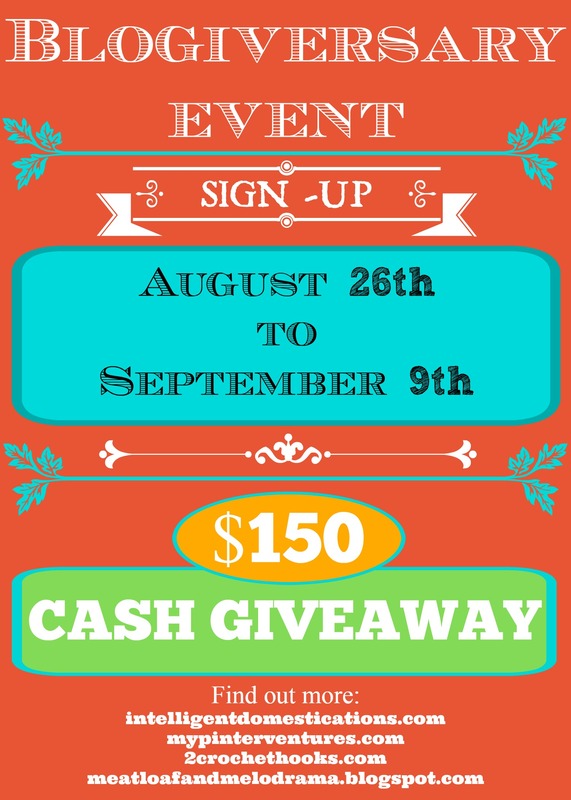 with a $150 Cash Giveaway and surprise prizes from each of our blogs! Total cash prize will be determined by participation with a minimum of $150.00 Paypal Cash with each host adding a surprise gift to the giveaway and sponsor gifts too! There will be at least 6 Winners – 1 winner for the $150 Cash, 1 surprise prize winner from each host’s blog (My Pinterventures, Intelligent Domestications, 2 Crochet Hooks, Meatloaf and Melodrama), and 1 sponsor(s) gift prize winner. How does this work? Have your social links on the Rafflecopter giveaway. First link is FREE, but we ask that you help us promote this giveaway by posting this giveaway sign-up on your blog for a FREE link. Co-host Spots are ONLY $12. Co-host spots come with up to 6 links in Rafflecopter, your photo with a link back to your blog in the giveaway post, and listings at the top of the Rafflecopter based on order registered. Links included: Facebook, Twitter, Instagram, Pinterest, StumbleUpon, and Bloglovin (order of links based on the order registered). Would you like to add your Etsy Shop As A Sponsor? What to do? Copy and paste this post onto your blog (picture link provided on sign-up form). The more participants, the more successful the giveaway. Plus, more participants means more exposure for all involved! My Pinterventures, Intelligent Domestication, 2 Crochet Hooks, and Meatloaf and Melodrama are turning One! Sounds like a great giveaway! Signing up! MJ, thank you so much for signing up to Co-host with us! It is shaping up to be a really good giveaway event! Congrats on your first year! I’m coming up on three months, myself. 🙂 That said, I’d love to cohost, if you’d have me!! I hear giveaways are a great way to get traffic/subs, plus I love making people smile, and I’m looking for some great blogger buddies. Erica, I’m so glad you stopped by. Let me know if you need any help with the registration process! Show me the money!!! Great giveaway! Happy Blogiversary! Louida, winning is always great, especially when it’s money! We plan to have a number of prizes for our readers to win. Hope you can participate. Sounds like a really fun Giveaway! Happy Blogiversary! Thank you Tiffany. I can’t believe I have made it through one whole year of blogging! Looks like a fun giveaway! I need to check my calendar to see what giveaways I’ve already booked. Thanks, Alli. We would love to have An Alli Event as part of our celebration!